Today we shine a light on the powerful interfaith center in Louisville, Kentucky and the home of the Annual Festival of Faiths. We proudly pass the Global Compassion Torch on this third day of World Interfaith Harmony Week Coopetition. A nationally acclaimed annual interfaith event of music, poetry, film, art and dialogue with internationally renowned spiritual leaders, thinkers, and practitioners. The festival programming honors the union between thinking globally and acting locally. Recently Mayor Greg Fischer announced that His Holiness the XIV Dalai Lama will return to Louisville in April 2017. And to spotlight the significance of the visit, the 22nd annual Festival of Faiths will move to April 19-24 and culminate with talks by the Dalai Lama. The Mayor, joined by 2017 Festival chairman Owsley Brown III, made the announcement during a recent press conference at the George Garvin Brown Garden, 415 W. Muhammad Ali Blvd. The title of the 2017 Festival is “Compassion: Shining like the Sun.” His Holiness the Dalai Lama will deliver talks on universal human values and nonviolence at the Yum! Center on Sunday, April 23, and at a large youth event on Monday, April 24. The visit is being planned by several local organizations involved in the city’s compassion initiatives, including the Mayor’s office, the Center for Interfaith Relations, Drepung Gomang Center for Engaging Compassion, and the newly formed International Center for Compassionate Cities. Since taking office in 2011, Mayor Fischer has helped champion a city-wide campaign for compassion, including his Give a Day week of service, Compassionate Louisville and the Compassionate Schools Project. He has been a longtime supporter of Louisville’s signature interfaith event, the Festival of Faiths, and worked with the Festival’s Chairman Owsley Brown III, as well as Jefferson County Public Schools Superintendent, Dr. Donna Hargens, to launch the Compassionate Schools Project in 2015. The Festival of Faiths is a nationally acclaimed interfaith event of music, poetry, film, art and dialogue with internationally renowned spiritual leaders, thinkers and practitioners. It is designed as a platform for holding conversations on meaning in a time of multiple crises of meaning; and respecting the essential union between thinking globally and acting locally. Theologian Richard Rohr calls the Festival “the Sundance of the Sacred,” and the Huffington Post included it among America’s top 7 spiritual travel destinations. Share your appreciation and gratitude for The Festival of Faiths on the Global Compassion Report Map with thousands of agents of compassion and hundreds of teams playing World Interfaith Harmony Week, striving together to make peace with #AllFaithsOneLove. 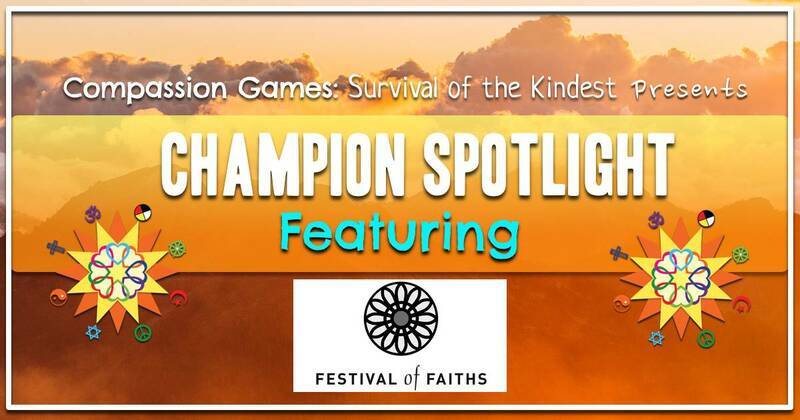 Join the action and learn more about this event and how you can participate with these champions of compassion at www.FestivalofFaiths.org . Watch a featured video from Festival of Faiths Called, Exploration of Sacred Pathways to Non Violence.